Like many other MobileMe users, I spent part of Saturday pulling content off my little corner of the Apple universe and saving it to the computer. As of today, it's goodbye MobileMe, hello iCloud. I was greeted with this message when opening Aperture. This morning, however, when I opened my Aperture library to work on the TDS Photo Assignment (to be published soon), there was this parting message: "Click OK to move albums you have published to the MobileMe gallery to the Albums section of your library to preserve them." Aww shucks! 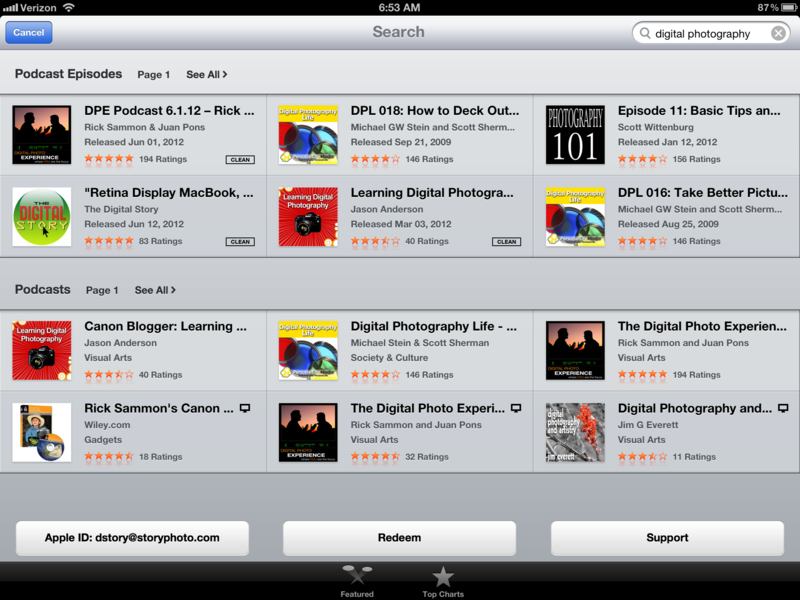 Apple will relocate my MobileMe galleries to Aperture. By the looks of the progress bar underway now, this will take a while. But, what a considerate eulogy for an old friend. 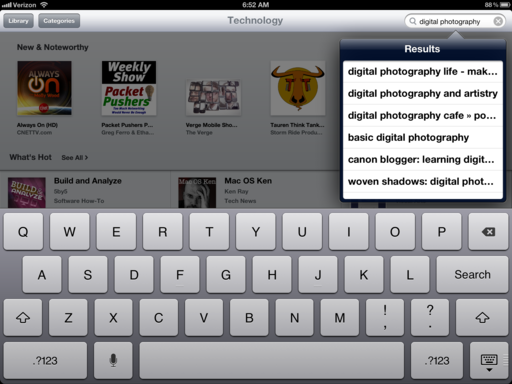 How versatile is the iPhone 4S? Nick Fancher, an Ohio based photographer, posted a "behind the scenes" video of a fashion shoot he did with just an iPhone 4S and a reflector as a fill light. He edited the images with Photoshop Express and Snapseed. Take a look! 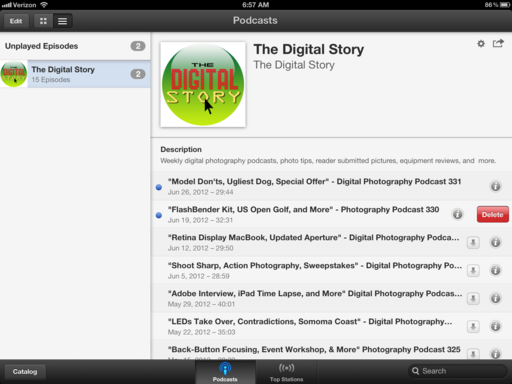 You'll find The Digital Story in the new Apple Podcasts app. Subscribe (for free) today. 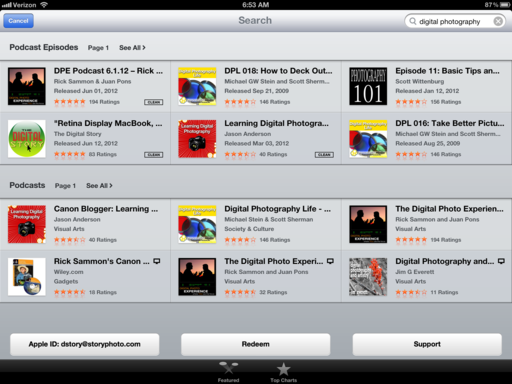 Podcasts are now out of iTunes and reside in their own app called Podcasts, which is available for free in the App Store. At first it may seem a little confusing to find and listen to your favorite episodes. So here's a quick walk through. 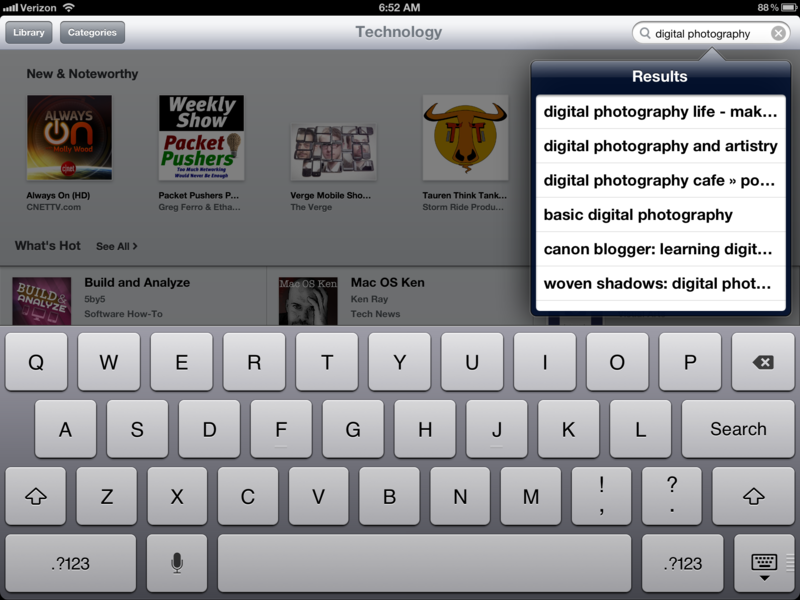 Entering text in the Search field. One you find a podcast or episode you want to try, tap on it to reveal more information. You'll be presented with the most recent episodes for that podcast. You can listen to any of the selections by tapping on their title (streaming). 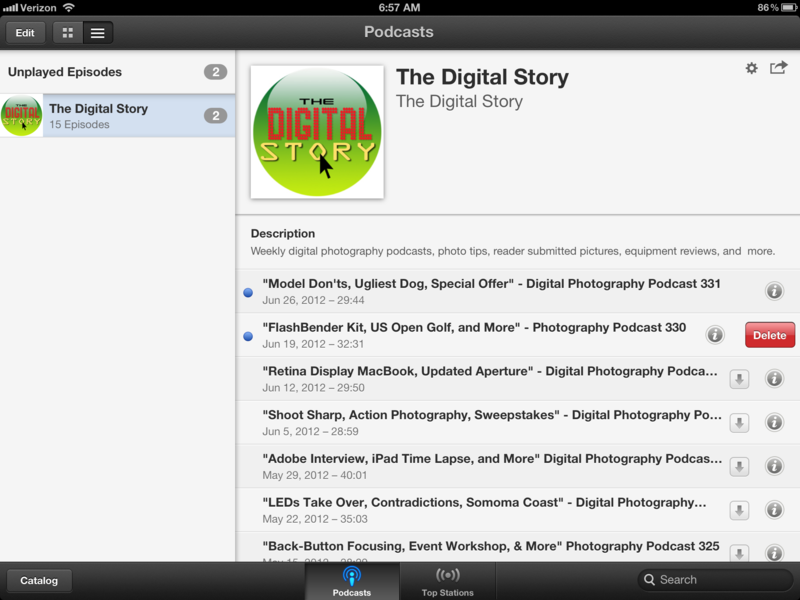 If you want to download it for listening at another time, tap the "download arrow." 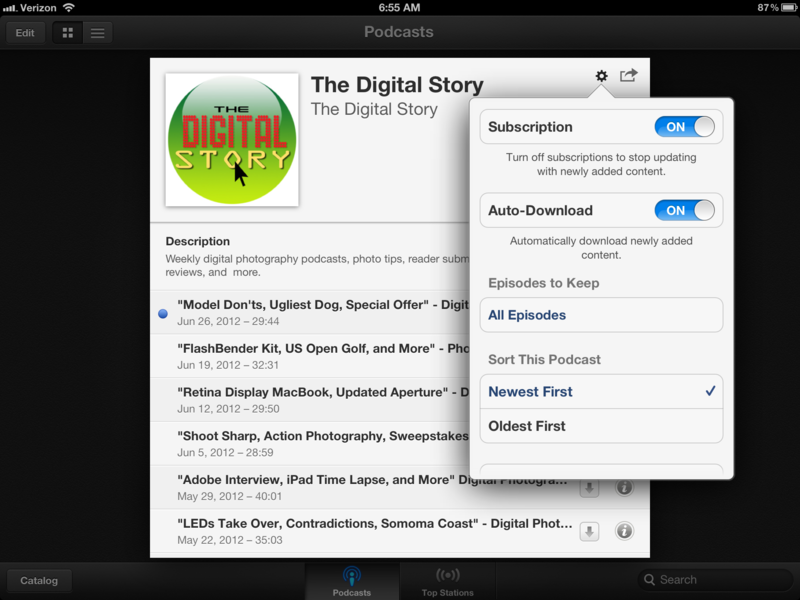 You can also subscribe to the show by tapping the big "Subscribe" button. 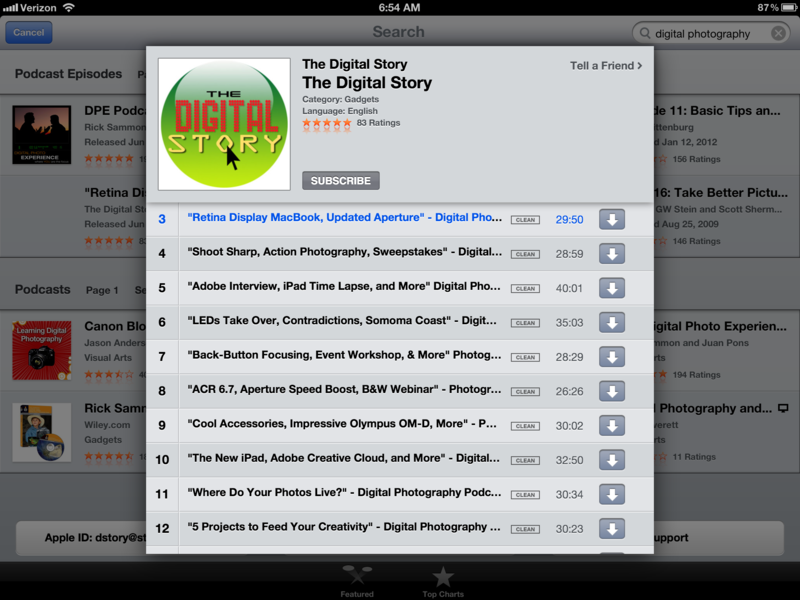 Listen (tap on title), Download (tap on download arrow), or Subscribe. Once you've subscribed to a show, it appears in your Library. You can see it by tapping on the "Library" button. At this point you can fine-tune some of the settings. 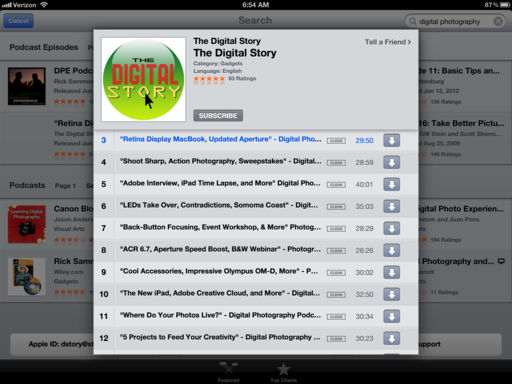 On the iPad, click on the "gear" icon in the upper right corner to reveal the settings panel. On the iPhone, tap the arrow bracket > in the upper right. You can also share this podcast with a friend by tapping the "Share" button in the upper right and choosing one of three options: Email, Tweet, or Message. For individual episodes that you've downloaded and have already listened to, you can delete them if you wish to free up space on your device. Simply "swipe to the right" on the downloaded episode to reveal the "Delete" button. Delete to remove downloaded shows from device. 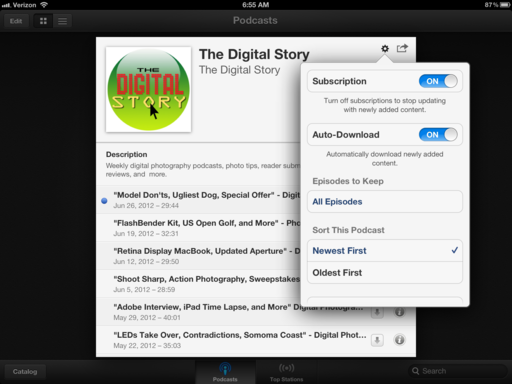 The Podcasts app seems well designed, and it's free. You might want to give it a try on your iPhone, iPod Touch, or iPad. Giants pitcher Ryan Vogelsong had his stuff working, and hitters Melky Cabrera and Buster Posey did their jobs at the plate. The result: Giants defeat Clayton Kershaw and the Dodgers 2-0 to pull within one game of the lead in the National League West. I was there in lower section 128, row 13 on the third base side with my Olympus OM-D E-M5 and Olympus 40-150mm zoom. 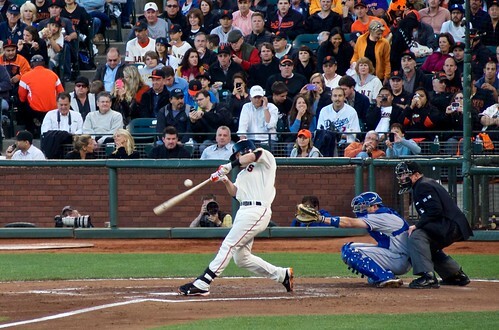 Buster Posey connects against the Dodgers at AT&T Park. Photo by Derrick Story. You can see the entire set of images on the TDS Flickr page. I parked the ISO at 1600 and used Aperture Priority to keep the zoom at the widest setting (f/4-f/5.6). When extended to 150mm on the OM-D, the effective power of the lens was 300mm because you double the focal length for micro four thirds. The high speed burst mode (9 fps) was a pleasure for capturing the action. And since the entire package was so compact, I was able to enjoy the game as a fan and grab a few photos when the action heated up. As you may have read in earlier posts, I had two temporary review copies of the Olympus OM-D, but was having problems purchasing one for myself. I had orders placed with the typical big camera suppliers, and they kept getting delayed. So I contacted the great people at Hunt's Photo & Video based in New England, US. I worked with Gary, who contacted Olympus US to see what he could do. Within a week my Olympus OM-D was on its way to me. The price was the same as what the other camera suppliers were charging, but the service was heads above. And yes, Hunt's offers free shipping too. They have a wonderful newsletter that comes out every couple weeks with lots of specials. I use it to help keep up on the latest releases. You might want to try it yourself. Thanks to Gary and the entire Hunt's crew for getting that Olympus OM-D in my hands so I could shoot this great baseball game at AT&T Park. 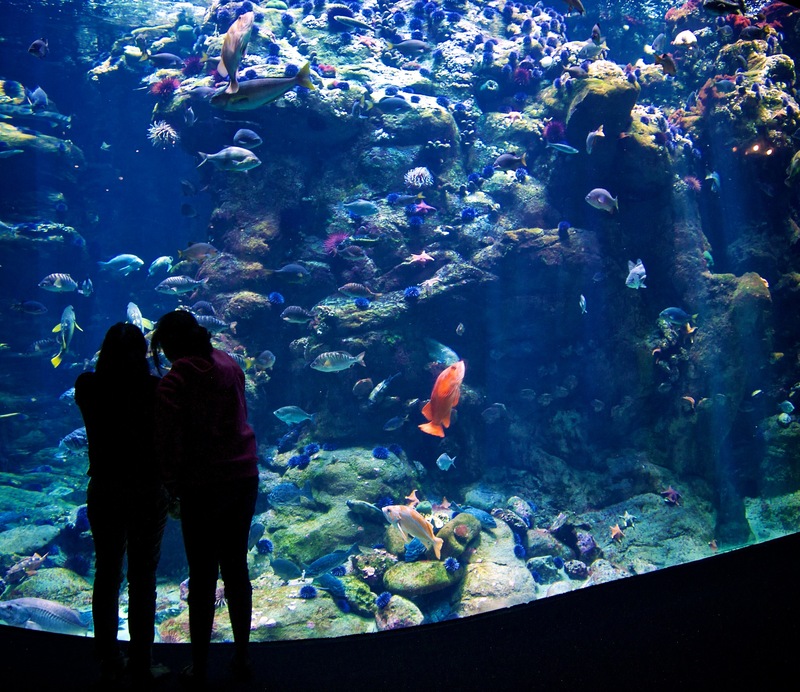 For the last few years, a chorus of us have been chanting that "the best camera is the one that you have with you." And I totally agree with that. But with high-end point & shoots improving in quality, and Compact System Cameras finding their stride, the "best camera with you" doesn't always have to be your mobile phone. 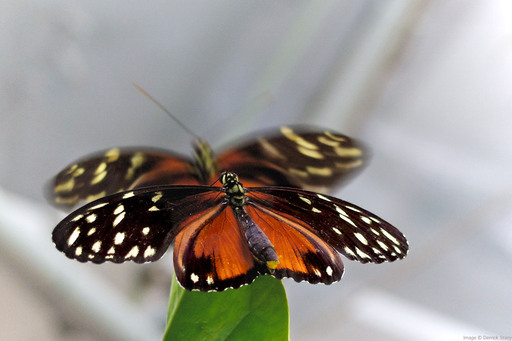 "Courting Butterflies" captured with an Olympus E-PL2 with stock 14-42mm zoom during a family outing. Photo by Derrick Story. Click on image for larger version. Don't get me wrong. I love shooting with my iPhone 4S. And there have been countless occasions where it has produced wonderful images I would not have otherwise captured. But whenever possible, I also tote a micro four thirds camera, such as an Olympus PEN, even on the most casual of family outings. Why? Greater choice in lenses. I can use a compact zoom or a prime lens, depending on my mood. Raw files. Don't need to say more here. Better shutter speed and aperture control. Bigger files, in case I want to make bigger prints. More options, such as flash control, metering patterns, etc. I enjoy those moments where I can wander off for a short bit and take a few pictures. In those instances, I love having a more advanced camera... while still knowing the iPhone is in my pocket if I need it. I upgraded to the new MacBook Pro with Retina display for my everyday work. Chief among the reasons why was the 15" Retina display and the NIVIDA graphics card. Just for fun, I loaded the same Raw file in Aperture 3.3 on both the new MacBook Pro and my 2010 MacBook Air (which I like a lot). The results were interesting. 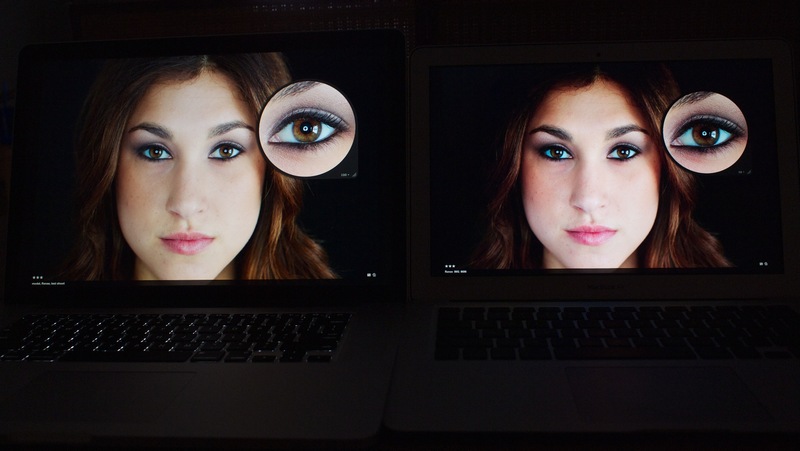 MacBook Pro Retina Display on the left, 2010 MacBook Air on the right. Click on image for larger version. Photo by Derrick Story. Specs aside, the first thing that jumped out at me is that the Retina display is more "photographic" than the image on the MacBook Air. I know many people are thinking detail with this display, but what I noticed is a more subtle gradation of tones. That's what I mean by more photographic. The image on the Retina display has some of the characteristics of a film based print. Look at the hair and the left side of the face. The next attribute that impressed me was color. There is more of it in the Retina display. Keep in mind that it's just not the LCD we're talking about here. There is an entire set of technologies under the hood, that rolled up, contribute to the final image. 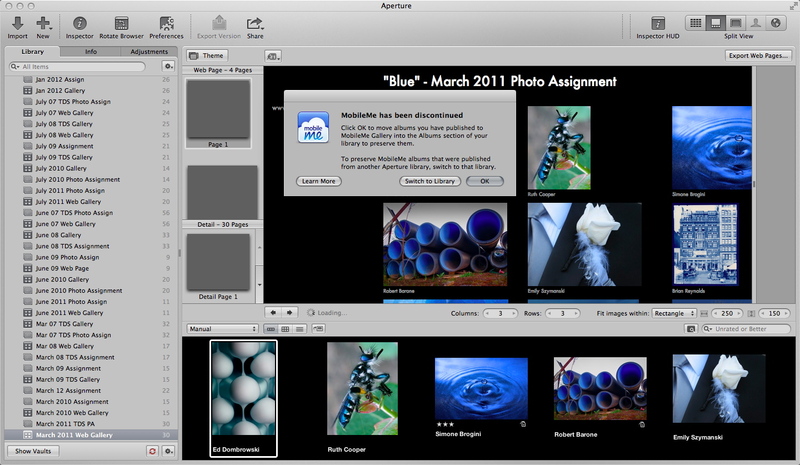 Both displays were set to the "Color LCD" profile with exactly the same file shown full screen mode in Aperture 3.3. The color was more accurate on the Retina display. No calibration on either machine. This is "out of the box" stuff. As you might expect, there's a bump in detail too. But it's not an "earth shattering going to change the world" improvement. And I think part of the detail improvement is the better handling of tones so you can actually see the detail... if you know what I mean. None of this is intended to be scientific. I'm a photographer walking by two computers with the same image on their screens. It's like the HD television wall at Best Buy. Even the comparison image here is a snapshot captured with an Olympus E-PL2 that was in my backpack at the time. But, if you just go by what you see on the screen, then I have to say that what I like about the Retina display is that I feel like I'm looking at a photograph, not a computer screen. Is that worth the $2,199 I paid for the 15" MacBook Pro? Well, considering how many pictures I look at on a weekly basis... the answer is yes.